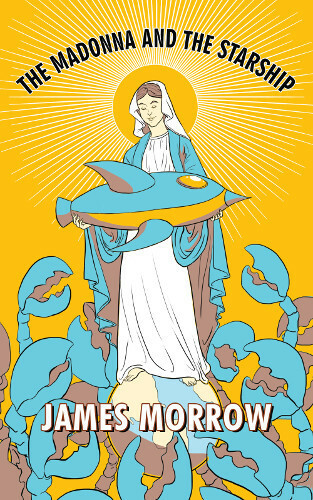 On his More Red Ink blog, award-winning book and copy editor Marty Halpern recounts his working relationship with James Morrow, “an absolute master of the sardonic.” His account culminates with the forthcoming The Madonna and the Starship, which he’s currently copy editing for Tachyon. I liked my job. Just as our show enabled kids to fantasize that they were star sailors, so did my scripting duties allow me to imagine that I was a playwright, though I knew perfectly well that nobody was about to confuse a space schooner called theTriton with a streetcar named Desire. But, Jastrow’s day-to-day normalcy was interrupted by the arrival of two lobster-like aliens — Wulawand and Volavont, from the planet Qualimosa in the Procyon system: a planet of “logical positivists.” Unfortunately, this didn’t bode well for Kurt Jastrow’s love interest, Connie Osborne, who wrote and produced a Sunday morning religious program called Not By Bread Alone. Certain that the program’s audience represented “a hive of irrationalist vermin,” the Qualimosans planned to piggyback their death-ray onto the broadcast signal of Not By Bread Alone, to every NBC affiliate. Come Sunday morning, at ten minutes past ten o’clock, the Earth would be cleansed of nearly two million irrationalists. Kurt and Connie now had less that two days to write, cast, and rehearse a replacement episode of Not By Bread Alone, one that was so perfectly rational and utterly absurd as to foil the Qualimosans’ plans. Read the rest of Marty’s fascinating post about James Morrow at More Red Ink. For more on The Madonna and the Starship, visit the Tachyon page.